After the international successes of his films Nosferatu and The Last Laugh, Ufa studios gave F. W. Murnau carte blanche to bring to the screen his version of Goethe's classic tale Faust. Here an artist had a huge budget and the power of a large studio behind him. He created a technical marvel and remarkable film. War, Famine and Pestilence ride across the sky. 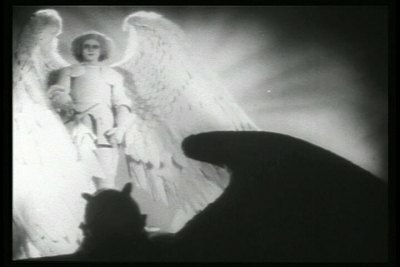 The Devil (Emil Jannings) looks on as they spread their disaster, his large wings expanding to engulf the world. But rays of light shine out from behind the Devil. An Angel of the Lord appears and reminds Satan that he does not have dominion over the Earth. The Devil claims that the Earth is his since he can corrupt any one he wants to. The Angel points out Faust (Gösta Ekman,) and asks if he is corruptible. The Devil and the Angel make a wager: If the Devil can corrupt Faust, he will gain control over the Earth, if not, he must leave the world alone. The Devil starts by casting a plague on Faust's village. In a few day, half the people have died. Faust prays for an entire day and night, but the medicine he has still doesn't help cure the stricken. In a moment of rage at his uselessness, Faust throws his books into the fire. While one is burning, it opens up and Faust reads an incantation for summoning Mephisto and gaining earthly powers. He pulls the book from the fire. The next evening he goes out to the crossroads and summons Mephisto. Startled and frightened when he appears, Faust runs home, only to find the Devil waiting there for him. Mephisto tempts him, and Faust finally concedes to renounce God for one day, if the Devil will do his bidding. They sign in blood. The first thing Faust does with his new found powers is to cure the people in his village. He is successful until a girl arrives clutching a cross. He cannot get past the crucifix and the people realizes that his power comes from the Devil and start to stone him. He escapes to his room where the devil tempts him once again, this time with youth. The old man can not resist this offer, and is transformed into a charming young man. Mephisto then takes Faust to a beautiful princess and helps him seduce her. But just as he is getting ready to join her in her bed, his time runs out. Faust can not stand the thought of becoming old again, so he agrees to make their deal permanent. With the Devil always one step ahead of him, is there anyway for Faust to save his soul and all of humanity with it? This is an amazing film. The effects were great for the time, and still impress. It is interesting to note that Murnau filmed this movie entirely on sound stages, eschewing location shoots that he used so effectively in Nosferatu (and would use again when filming Tabu.) He wanted the control over all aspects of the film that a studio shoot would give him, and he used it to the fullest advantage. The intricate special effects and camera tricks he was able to create make the film a masterpiece. The camera works was exceptional, with many shots blocked out to make them look like paintings. The smoke and flowing costumes all added to the effect. Murnau liberated the camera in this movie too, like he did in The Last Laugh (though not to the extent he did in the earlier picture.) He controlled the film's space, and filled it with movement and detail. A gorgeous film to watch. The acting was first class all around. Lillian Gish was originally cast as Gretchen, but wouldn't do the movie unless her cameraman, Charles Rosher, could shoot it. Ufa refused to this demand, and Camilla Horn, an unknown German actress was given the part. She would go on and have a successful career in movies and TV that lasted well into the 1980's. Gösta Ekman did a wonderful job as both the young and old Faust. His movements and gestures when he was old were very realistic and convincing. But the star of the show was Emil Jannings as Mephisto. He played the role with the right mix of evilness and humor (it really looked like he was enjoying putting poor Faust through the ringer.) Truly a masterpiece of early film art. Viewers have a choice between a piano score adapted from the original 1926 orchestral arrangement and performed Perez de Azpeitia and score by the Mont Alto Motion Picture Orchestra. Both sound very good, but I preferred the Mont Alto score a bit more. A multi-piece group just fills the room wonderfully and their music did just that. It's nice to have a choice though, and you can't go wrong with either audio track. This new HD restoration is marvelous. The MPEG-4 AVC encoded image is a great improvement over the other version of Faust that I've screened, the 2001 Kino DVD. (Kino also released the film in 2009 on DVD, but I have not seen that version.) While there is some natural grain and the picture has wonderful blacks, which is crucial for a move that was filmed to be dark and shadow-filled, and the level of detail is very good. This restoration of the original German release is undoubtedly the best this film has looked in the last 80 years. Excellent all around. The extras were all ported over from earlier releases of this film. First off is an interesting 53-minute documentary on the film, The Language of Shadows: Faust. This looks at the cast and the production of the movie but the real interesting thing is they spend a lot of time comparing different takes of scenes that were released in different countries. Since this was such an expensive production, it had an international release, which meant that many prints had to be created. Since a negative can only be reproduced so many times before it wears out, all of the scenes were filmed many times with multiple cameras. These negatives were pieced together to make the film, with the very best versions of each scene going into the German domestic release print. There are seven negatives from the movie that still exist, and seeing the various takes that differ in length, pacing, and performance is fascinating. There is also an 11-minute reel of screen-test footage from Mary Pickford and Ernst Lubitsch's abandoned 1923 production of Marguerite and Faust. It consists of different actors preforming a few different scenes. Unfortunately, Mary Pickford is not seen in any of them. Finally, there is the 1930 American version of the film included on a separate DVD. This seems to be the same print as was released by Kino in 2001 and has a musical score by Timothy Brock that is performed by the Olympia Chamber Orchestra. This was Murnau's last film in Germany. 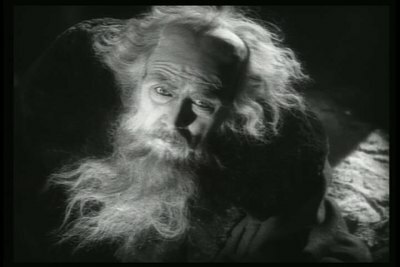 After filming Faust, Murnau left Ufa and went to Hollywood. This artistic yet attention-grabbing film was a fine ending to his German period. The special effects were awe inspiring for the time, and the morality play was interesting. The picture on this Blu-ray is outstanding for a film this old, and the musical tracks are both excellent. One of Murnau's great films on a great Blu-ray set. Highly Recommended.